· How can you enable your business partners to deliver direct quick win benefits to the business? · How much time is really spent on taking action to drive business performance? We have solutions to meet the above three challenges typically encountered by HR Business teams. HR Business Partners need to believe that they are not just partnering with the business – but are themselves a vital part of the business. This can be achieved by linking HR Business Partner targets directly to business results. So…how can you achieve more valuable business partnering? 60 Bits Consulting can assist you to build a business case for HR Business Partnering that is specific for your organization. You probably haven’t realized it, but did you know that you have over 60,000 conversations with yourself each day? It’s true. Unfortunately, most of these conversations are about yourself, and according to research, 80% of these are negative thoughts. This means we have over 48,000 negative thoughts each day. We spend so much of our time telling ourselves we’re not good enough, not smart enough, not pretty enough, not talented enough. These negative thoughts have a powerful effect on us, and can affect our attitude, our motivation to act, our physiology, and even our biochemistry. I like to demonstrate this phenomena in my live trainings. When you experience negative thoughts—thoughts that create emotional states such as fear, anger, anxiety, guilt, shame, or regret—the muscles in your body become weaker. 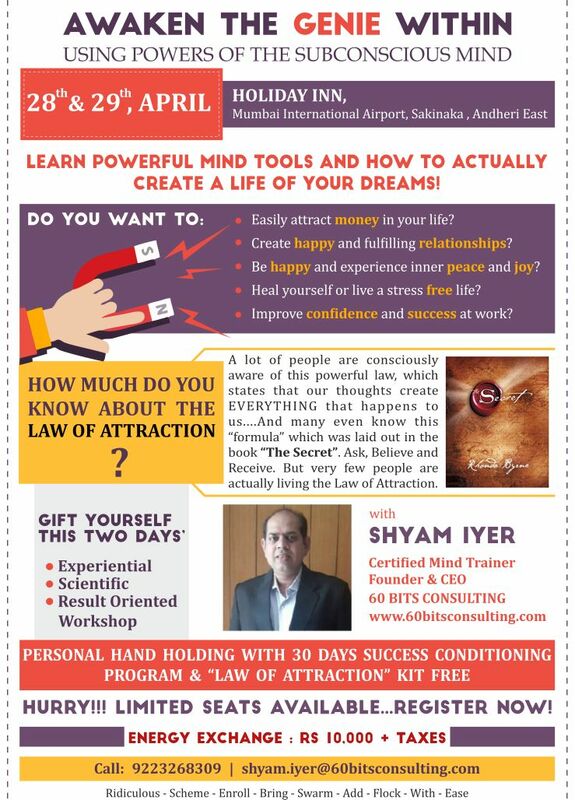 You can witness this exercise first-hand by participating in my two days workshop which is happening on 28th and 29th April at Holiday Inn, Mumbai to experience not only this incredible exercise, but so many more! This one exercise I described above shows that when you experience positive thoughts, you flood your brain with endorphins, which helps you become more alert and centered. Positive thinking also increases pleasure while reducing physical pain. As a result, you become more confident, optimistic, and motivated to achieve your goals. Once you replace negative expectations with positive ones—when you begin to believe that what you want is possible—your brain will work on accomplishing that goal for you. In fact, your subconscious mind will do whatever is necessary to make it a reality. But if you let negative thoughts interfere with that possibility, your subconscious will ensure you won’t accomplish your dreams and goals. Just remember... Your beliefs are a choice! So make the choice to believe in yourself, think positively, and never let negative thoughts determine what you’re capable of. Here’s your chance to take a powerful, two days long “time-out” from your busy life so you can take a step back, refocus your energy, and turn your attention to the things that matter to you most. · Plus, experiencing a deeper level of joy, meaning, and abundance in everything you do… and so much more! So if you’re curious to find out how far you can journey toward your goals and dreams in two days, I encourage you to join me and find out! WHAT MAKES “LIFE’S BIG WINNERS” SO SUCCESSFUL? You probably know what I’m going to say here... it’s their ability to take ACTION and do what it takes to make their dreams a reality! Successful people are willing to step outside their comfort zone and do something different. They feel the fear and take action anyway! They take risks... analyze what’s working and what’s not... and get the mentorship and support they need from people who have already walked the path before them. Here’s your chance to follow their lead. Take the leap and spend the two days with me on 28th and 29th April – and I guarantee you will come away with at LEAST one life-changing epiphany (if not dozens) that will transform your mindset and help you get better results in everything you do. Let’s make 2018 the year everything changes. I am in Indore from 11th - 14th April facilitating a Leadership workshop for our client. Would be interested to explore business opportunities with HR / OD / Trainer friends of mine to explore synergies and networking. To connect with me call +91 9223268309 and will be happy to meet up.